You guessed it…another Thursday and another Create with Connie and Mary Thursday Challenge. We have been having so much FUN with our Create with Connie and Mary Holiday Collection 2014 and it really has me in a Christmas mood! This week we have a color challenge for you (Lost Lagoon, Mossy Meadow, Silver) and I thought the Letterpress Winter set would just be perfect with these colors! Add pieces of Silver 1/8″ Taffeta Ribbon to top and bottom of panel using glue. Stamp greeting using Lost Lagoon and Mossy Meadow. Add some Snowflakes and silver sequins to finish it off. 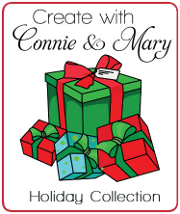 We are finishing up week 2 (of 4) of the Create with Connie and Mary Holiday Collection 2014 where we are featuring the Christmas/Holiday (no Halloween/Fall) products from the Holiday Mini! This entry was posted in Create with Connie and Mary and tagged Letterpress Winter. Bookmark the permalink. A beautiful card with beautiful details. 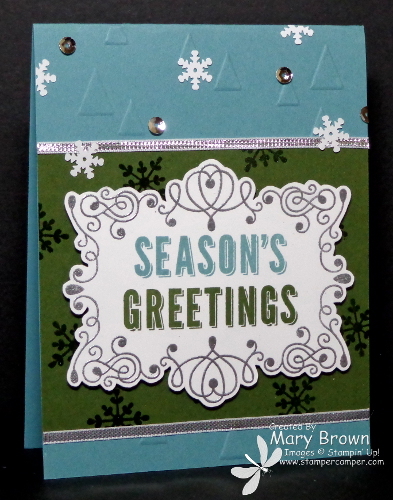 I especially love all of the heat embossing – it makes everything stand out! That frame looks great cut out by hand! And the greeting works beautifully inside of it! Love it! Gorgeous Letterpress Winter card! I love the sentiment stamped in two colors! Another pretty card using this set!! Beautiful way to use the colors and all the wonderful details you’ve added!